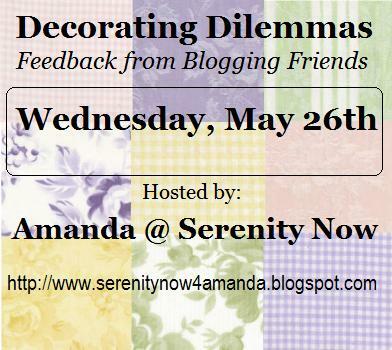 Serenity Now: Decorating Dilemmas Party...Round 8! Welcome to my Decorating Dilemmas party, a spot for bloggers to link up with a Decorating Dilemma (or Solution) and receive some helpful feedback from other participants. This helps your readers find the party to participate in the fun. 2. When you add your link to my inlinkz list, please be sure to use the permalink to your specific party post, not your blog's homepage. Please feel free to email me if you have questions or trouble adding your link. Sometimes the inlinkz system is a little bit testy. 3. Please, pretty please, leave me a comment with your link. 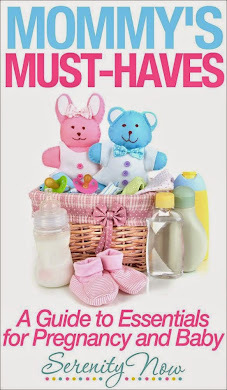 Please try to visit at least one or two other links on the list. If you need a few days to do that, it's fine with me. I try to host parties that include participation and encourage community. Otherwise, this is just a long list of links and that's no fun for anyone. You'll be surprised at how easy (and fun!) it is to see someone else's Dilemma and come up with all sorts of creative solutions. Okay, link up here and don't forget to scroll down and let me know what I should do with my Dilemma. The party will be open for new links until 10 pm ET on Wednesday. Short, but sweet! I've had this old crate for ages. I was using to keep the dog toys in, which was stupid because neither dog really plays with toys. They'd much rather nap and lay on the air conditioning vents. ~Clean it up and leave it as-is OR paint it? If I paint it, white or black? Stencil something on it? What to stencil? So many ideas. OK, I love the shape and the wood of that crate. I love anything nostalgic, especially crates with words, but something about the fact that it says "Canned Pink Salmon" makes me want to paint it. A bright color. Like turquoise or apple green. Something that will make you surely want to reach for your 'must reads' !! I think that you would completely ruin the character of this cool old box if you paint it. Leave it like it is!!! I love the rustic look of it. Maybe you could paint or decorate the inside of it. Or a stain that would show the original text through it? I would like to title it "Lamps Solution"
Thank you for hosting. I got a lot of great advice at the last party. I love that crate! I really like the colors and the faded lettering on it... perhaps paint it a light color so that you would still be able to see what it says? Definitely a good spot for magazines or for toys! It's so funny, I was totally in favor of leaving it as is (charm, character, etc...) until I read Centsational Girl's post and realized it says "canned pink salmon". Now I say paint it! Especially if you've had it forever as is. You might fall in love with it all over again after it's been reinvented! Also, I've tried to add my "design dilemma" twice seemingly unsuccessfully. I'll try again later. Glad I found your link party because I could really use some help! Thank you for hosting! Love the crate, but the fact that it's pink salmon kind of weirds me out, but remember I don't eat anything that swims! But I do love the old crate look, but it would look amazing painted too.....I say that if it fits in with the decor/colors of the room leave it, but if you paint it I say paint it a bright color, distress and glaze. Can't wait to see what you do! Hello my friend! I love your Decorating Dilemmas party! I think that crate is really cool. I would leave it as it is. I love the worn look and the words on it. It might be cool to see if you can find a couple other boxes/crates that are different sizes and use them together somewhere. I am excited to join up. I am going to try to take my pictures in the morning and link up! I wouldn't paint the whole thing. I think painting the inside a really vibrant color would be awesome...maybe bright red or yellow. You could also paint a stripe around the crate. That would add some color and interest without covering up all the fun rustic details. No paint! That's the charm of it! I like the crate as is, but I am also a huge fan of painting it...basically I am useless in helping you make a decision, BUT the crate is lovely. 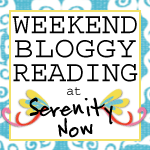 I would also love it if you stopped by my blog. I can't wait to find a dilemma to post about. Shouldn't take me long to look around my house and find something! Love your wooden box! I vote, clean it up and leave it as it. It is wonderful! I'm with most of the others - don't paint it!! :) It is so unique. I have to say I'm completely torn. I love the vintage look, but I don't think I'd want "Canned Pink Salmon" sitting in my reading area. I would paint and distress it. I also really like the doily look that Larissa posted. Super cute, Although I'd probably do a pattern around the bottom or top edge with the doilies instead of random placement. I would leave it as is, even if it does say Canned Pink Salmon. Maybe, if anything, whitewash it, so there's just a little white, with the words showing through. Hello cute friend! I linked up my kitchen dilemma. I have a crazy day today, but will stop by the links tonight! Paint only the inside! My pick would be black, or deep brown, it would protect the insde, and your mags, and not show as much "newsprint wear" as the lighter colours do. Paint it white & stencil w your fav bible verse or saying. Its a great storage piece! Love it just the way it is....sooo much character. It could be a great plant holder too. Looks like a fun party! I would leave as is. I love it! I use my husbands wooden tool box (he made in high school) for my magazines, its perfect for them. I'd leave it as is, but then I love canned salmon! *lol* It would look pretty and all shabby chic with a thick coat of white paint! I have a similar dilemma, but didn't get my act together an get it posted in time to link up. Maybe next time! I'm off to peruse those who did... is it wrong that I love giving advice?! Oh my gracious! I loooove it just as it is!! The color is gorgeous. I've actually been looking for something similar to use in my bathroom to put rolled up towels in. I, personally, think it's perfect. Oh, I love that crate! It's so hard to say whether to stick with the old or go with the new! Can't wait to see what you come up with, Ps thanks for doing this, you got me back on the blog! It looks like you have a great party going on. . . as usual! I've been away from my computer all day. . . didn't even get to publish a post today, much less a link to your party. I sure hate to miss it--your parties are always fun, and I especially love the way this one promotes interaction among bloggers. That crate is cool. I think it could look wonderful painted, but to tell the truth, it speaks to me as a canned salmon crate. My mother always bought canned pink salmon. She used it to make salmon croquettes. But about once a year, she would SPLURGE and buy RED SALMON. It was a big event, that purchase of canned red salmon. Isn't that funny? Things were different then. But honestly, sometimes I think homemakers of my mom's generation were happier overall. They didn't have much, but they had lots of friends who were in the same boat. Leave it! It looks great the way it is. But, really it would be cute painted white too. Can't wait to see what you do with it! I vote for leave it as is! I have my Country Living magazines in an old peach crate! Thanks for hosting, here is my link! Painting it would just make it a very ordinary crate. I would clean it up and enhance the wood with a wood conditioner followed by a natural stain that would bring out the natural beauty of the wood. That's a tough one. It's authentic the way it is. I like the idea of stacking it with other old crates that someone suggested (above). I am having fun at the party, already. I'm running a bit late as I'm out of town, but will visit as many links as I can :). Hey Amanda! I'm a loser and didn't get a "dilemma" linked up for your party, but I'm looking at everyone who linked up and making comments! I love the crate. I would leave it "as is"!! I lOVE, LOVE it the way it is! It has so much character. And I love crates too. I put mine above hutches and armoires as a low cost accessory! I love just as is! I agree with others...maybe paint the inside? I can't believe you are done with school! we are making up snow days and go until June 10!